We often refer to the place of the Savior's first suffering as part of the Atonement as the Garden of Gethsemane. But actually, the New Testament does not mention the phrase "Garden of Gethsemane." Mark and Luke tell us that after the Last Supper, the Savior went to the Mt. of Olives (Mark 13:3; Luke 22:39). Both Matthew and Mark state that the Savior then retired to a place called Gethsemane (Matt. 26:36; Mark 14:32). In the Joseph Smith Translation of Mark 14:36 states: " And they came to a place which was named Gethsemane, which was a garden." John did not refer to Gethsemane but simply said that the Savior and his disciples went "over the brook Cedron, where was a garden, into the which he entered, and his disciples" (John 18:1). John called the place a "garden." 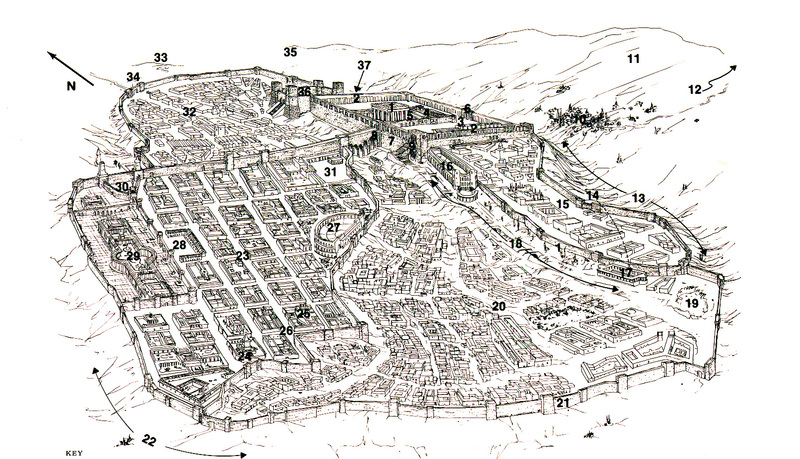 The Greek word translated "garden" is kepos which means "a cultivated tract of land." The garden - or cultivated tract of land - appears to have been an olive orchard. So what was Gethsemane? The Greek word Gethsemane comes from a Hebrew word or a similar Aramaic word, Gat Shemanim, meaning, "a press of oils." It was an olive press! It appears that the Savior went to an olive orchard. Then, having left eight of the apostles perhaps somewhere near the entrance to the orchard, he took Peter, James, and John and went to the garden's olive press. The following is a photo display of olive oil production in gethsemanes found in the Holy Land. 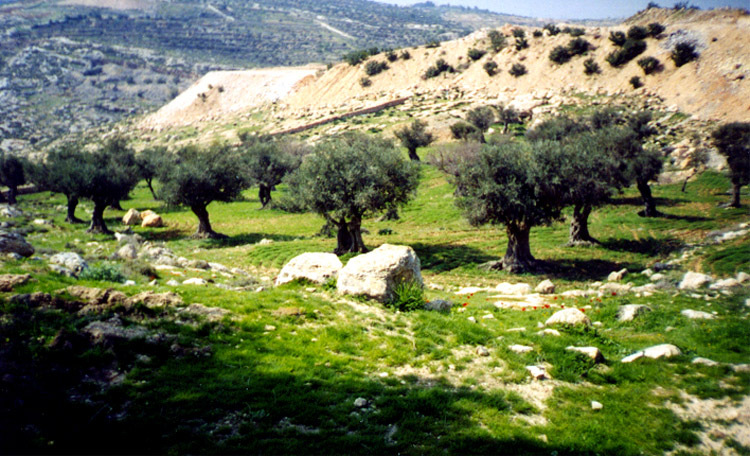 Gethsemane was located on the Mt of Olives which was east of Jerusalem (No. 11). 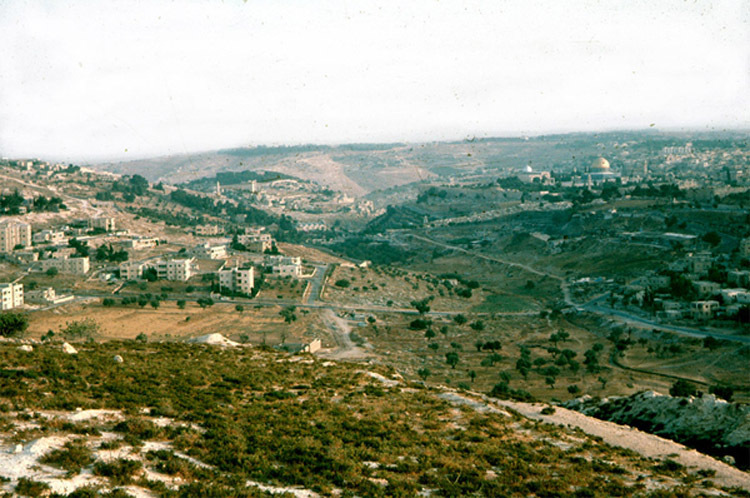 A picture I took in 1975 of the Kidron valley with Jerusalem on the right and the Mt. of Olives to the left. To harvest olives, a large sheet is placed under a tree and then the limbs of the olive tree are beat causing olives to fall onto the sheet. The olives are then collected. Olive processing began with first crushing olives in an olive crusher. 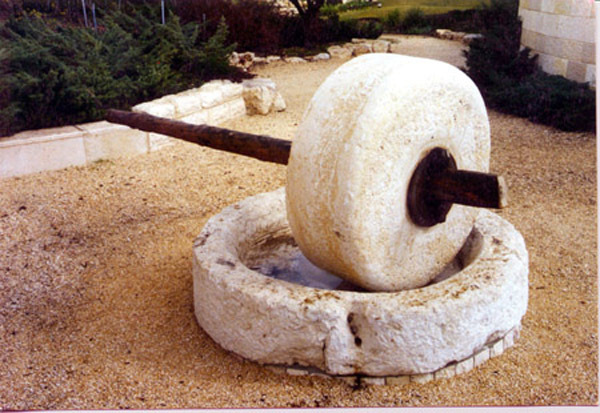 This is an authentic olive crusher at BYU's Jerusalem Center for Near Eastern Studies. Once olives are crushed, the crushed olives are scooped up and placed into a "mash sack" to be taken to the olive press. Anciently, there were two kinds of olive presses. 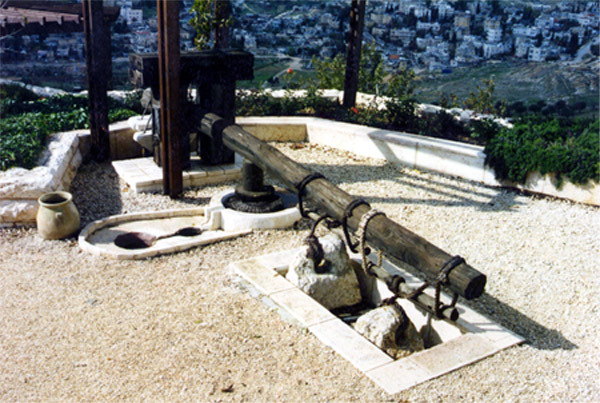 The olive press used at the time of Christ was a press beam. The mash sacks were placed towards the front of the beam under a round pressing board. Large stones were used to weigh down the beam pressing upon the mash sacks. The oil would drain into collecting bowls - seen to the left of the round pressing board and mash sacks. This picture is of BYU's Jerusalem Center's press beam. Having collected crushed olives from the crusher, a student places a mash sack into a round receptacle underneath the press board. Using wooden levers, the press beam is weighed down by rocks. As the beam presses down upon the mash sacks, olive oil oozes into the collecting bowls. Notice the color is a brownish red. Olive oil in collecting bowls. A second type of press, the screw press, came into use within a few hundred years after the time of Christ. Mash sacks are placed under the press board. Mash sacks are placed under the press block and the screw is tightened. Olive oil oozes down into the collecting tray. Note the color of the olive oil is brownish-red nearly resembling blood. 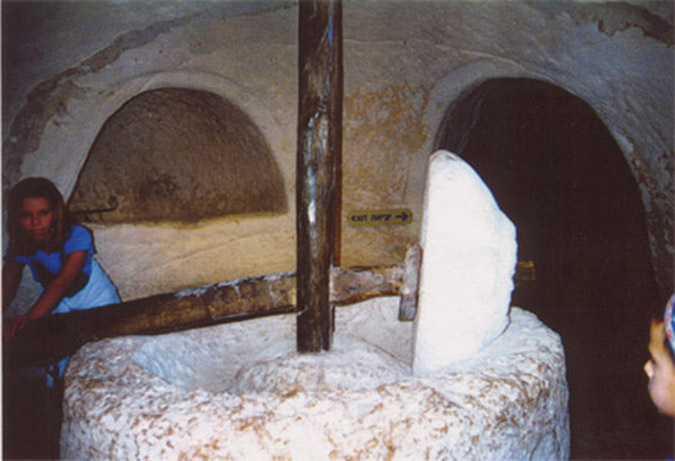 Archaeology has shown that olives presses were always located within buildings, such as this one in the ancient church at Kursi, or in caves. Olive oil production was done in the fall when the air temperatures are cooler. Since olive oil gels in cooler temperatures, oil production was done inside buildings or caves where air temperature could be controlled. My daughter, Neisah, and an olive crusher at Beit Guvrin. Olive press beam at Beit Guvrin. 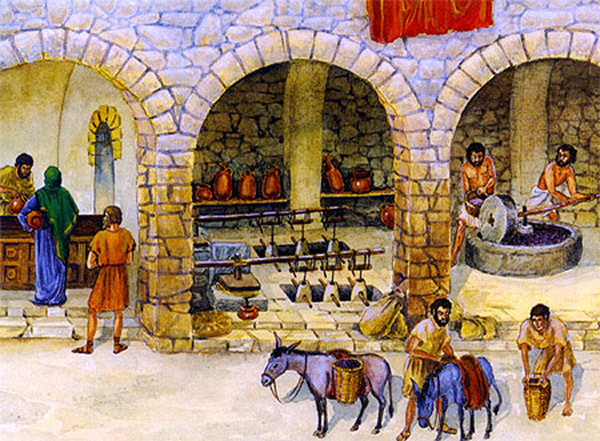 Olive oil production at the time of Christ. 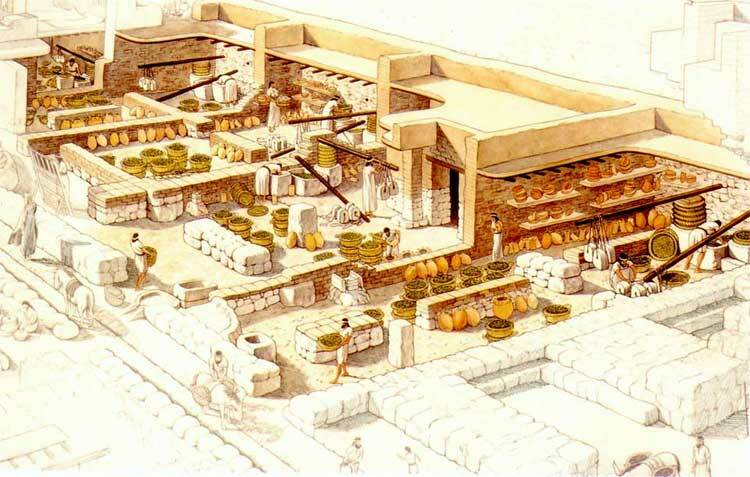 Artistic rendition of the olive oil production of the Philistine city of Ekron. From the foregoing it can be seen that a gethsemane is found within a cave or building. 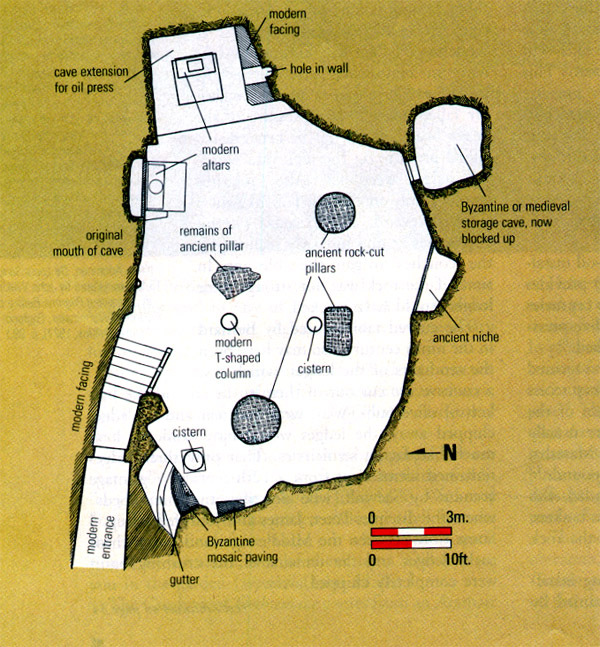 The following are pictures of the cave on the Mt. of Olives believed to be the location of the Gethsemane the Savior suffered in. 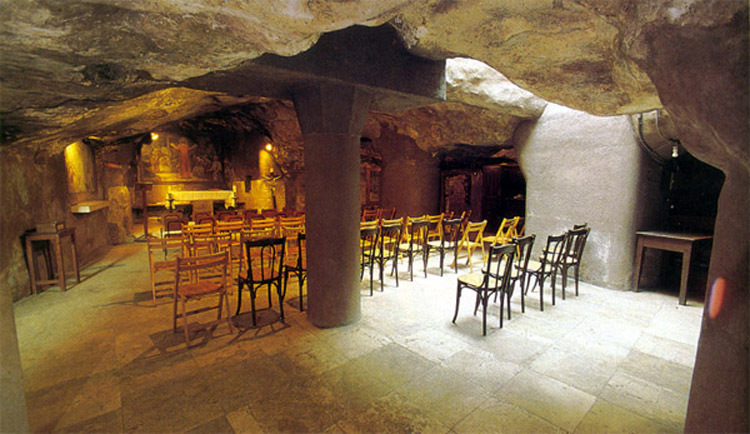 The cave has been turned into a church.